Typewalk 1915 is a contemporary typeface created by Sven Fuchs and published by Typocalypse which is available in 11 weights (from Thin to Heavy) and their italics. 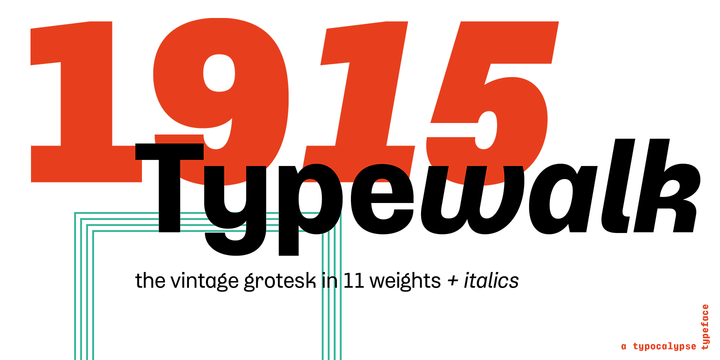 This vintage grotesk font was inspired by the letters which was used around 1915. It is ideal for editorial, branding, signage, cultural use. It works great with Typewalk Mono 1915 typeface. Enjoy! Price: starting from $39 for one font to $319,00 for all 22 fonts. A font description published on Thursday, May 18th, 2017 in Fonts, Sven Fuchs, Typocalypse by Alexandra that has 3,337 views.